Derived from the highest grade certified organic Schisandra berries, XandraPure™ is a premium grade 5:1 extract suitable for the production of nutritional supplements and functional foods and drinks with applications in oral hygiene and skin and hair care. Tiny, bright red Schisandra berries have long been used in traditional Chinese medicine for helping the body in a wide variety of ways. Schisandra is an adaptogen, which means it supports the body’s own natural functions to help it resist internal and external stressors. Among other things, it can support a healthy liver and aid both mental and physical performance. Potent, highly concentrated XandraPure™ has exceptional application in supplements, and is highly suitable for use in capsules, tablets and powdered formulas. XandraPure™ is particularly popular in energy, stamina, stress and work-life balance formulas. It is an especially valuable ingredient in traditional Chinese medicine formulas where it is known as wu wei zi (five flavour fruit). High water solubility makes XandraPure™ an ideal boost to juices and functional drink formulas. Because of its balancing, adaptogenic properties, XandraPure™ has special application both for energyHighand calming drink formulas, a growing, on-trend category. XandraPure’s earthy, faintly bitter taste also make it a popular addition to medicinal wines and tonics. XandraPure™ makes a wonderful addition to boutique tea brews, in fact, Schisandra berries are traditionally consumed brewed into a beautiful pinkish red tea. With high Vitamin E levels, natural antioxidant properties, and toning, astringent properties, Schisandra is popular in Europe and Asia as a functional ingredient in a range of oral hygiene and skin and hair care products. Schisandra has a long and distinguished history of use as an internal beauty aid by the women of the Chinese Imperial Court, making it an ideal ingredient for the beauty-from-within category. XandraPure™ is a natural source of more than forty powerful lignans including schizandrin, deoxyschizandrin, gomisins, and pregomisin. Lignans are phytoestrogens and studies have shown that they may have antioxidant potential as well as contribute to maintaining good cognitive health.1 Studies also show that the lignans present in Schisandra activate enzymes in liver cells that produce the important antioxidant glutathione, which can help maintain normal liver function. Schisandra provides support for healthy blood circulation and kidney function, as well as enhancing strength and energy levels and improving concentration. 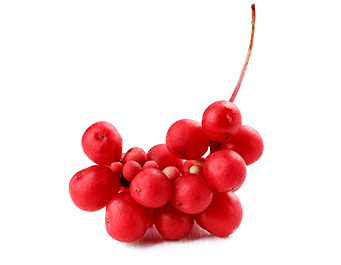 Schisandra may also help maintain good vision and hearing. It is used to soothe anxiety, assist with sleep, and help maintain overall wellbeing. 1 Free Radic Res. 2011 Aug;45(8):950-8. Epub 2011 May 26. Prevention of scopolamine-induced memory deficits by schisandrin B, an antioxidant lignan from Schisandra chinensis in mice. Giridharan VV, Thandavarayan RA, Sato S, Ko KM, Konishi T. Source Department of Functional and Analytical Food Sciences, Niigata University of Pharmacy & Applied Life Sciences (NUPALS), Niigata city 956 8603, Japan. 3 J Ethnopharmacol. 2008 Jul 23;118(2):183-212. Epub 2008 Apr 24. Pharmacology of Schisandra chinensis Bail. : an overview of Russian research and uses in medicine. Panossian A, Wikman G.